“We are islanders with the islanders”. Don Luigi de Giambattista, a Guanellian missionary, describes to Agenzia Fidesthe reality of his evangelical commitment in the Solomon Islands, in Oceania. Independent since 1978, the nation brings together a population of 650,000 inhabitants spread over 980 islands of which only 220 are inhabited. “Our mission began about two and a half years ago, in August 2016 – Don Luigi explains to Agenzia Fides – responding to an appeal of the diocese of Gizo”. 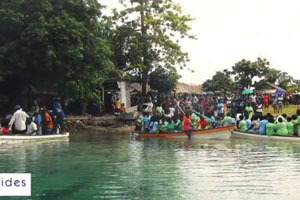 The effects of climate change are affecting the population of the Solomon Islands, as the local Church has been pointing out for years. Today the real problem is the rising of the ocean: in many islands the inhabitants raise wooden walls to save their homes. And the warming of the seas undermines fishing. Among the other destabilizing factors, tribal wars are not completely suppressed, as well as the lack of respect for women, victims of continuous domestic violence. This is the framework in which the local Church operates, and the Gospel message also passes through intuitions: in 2016, the year of the extraordinary Jubilee, the idea of a mobile and itinerant “Holy Door” from the capital to the most remote areas: “In order to build bridges of reconciliation – recalls the missionary – our Bishop, Luciano Capelli, decided to bring the holy door around, by sea, in all the parishes”. “Even today, there are wonderful testimonies, the fruit of this reconciliation that is urgent and that represents our commitment as Guanelliani”, he says. “The challenge of Guanellian missionary service in the diocese of Gizo is to reach the 22 small Christian communities entrusted to us. It often involves taking the boat to offer not only the sacraments but combining evangelization with human promotion”. An adventure that brings together all the resources available in the field: starting with the collaboration of the catechists, the leaders of villages, the teachers of the parish kindergartens. “The challenges – says Father Luigi – are to deepen the beauty of the Gospel of Jesus and connect faith with life”. We need to stem the resignation that these populations, on the outskirts of the world, are often victims of. “In harmony with the thought of our bishop – the Guanellian missionary concludes – we must help our people to dream, especially the young. We must help each other to make these dreams come true”. The Christian community in the Solomon Islands is relatively young: Anglicans are about 40% of the population, Catholics are 20% and the rest are divided into other Christian denominations; there are three Catholic dioceses and they are accompanied by 87 priests and 133 religious.